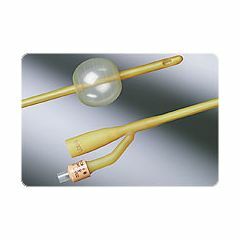 Bardex Lubricath Foley Catheter provides for smoother insertion and enhanced patient comfort through the hydrogel coating’s unique ability to absorb fluid, thus creating a hydrophilic “cushion” between the catheter surface and the urethra. Designed for long term use, especially for permanent urinary incontinence. Medium length- round tip with two staggered eyes. Single-use, Sterile. Lubricath hydrophilic polymer coating helps reduce irritation of the urethral mucosa and helps minimize encrustation.